Medical Malpractice & License Revocation: Has the Process Stalled in Oregon? Medical malpractice occurs when a doctor or other healthcare professional fails to properly diagnose or treat a patient. This can lead to claims filed for damages incurred by injured patients. In some cases, after an investigation by the Oregon Medical Board, a physician’s medical license will be revoked. The process begins with a complaint filed with the Board. How are Medical Malpractice Complaints Filed? Every year, the Oregon Medical Board receives between 750 and 850 written complaints. The complaints can come from patients and their families, hospitals, or other healthcare professionals. Some of these complaints are submitted to other state or professional organizations for review. Some are resolved quickly by the Oregon Medical Board’s investigative staff when they find that the physician did not violate any state laws or regulations. The Board’s Investigations Department reviews each complaint in order to determine if state law was violated. Each year between 300 and 400 of the complaints received by the Oregon Medical Board result in a complete investigation. There are 27 grounds for discipline or revocation of a medical license per the Medical Practice Act. Some of the grounds for discipline include gross or repeated acts of negligence, conviction of a criminal offense, unprofessional conduct, or substance abuse. The 27 violations are set forth at Oregon Revised Statutes (ORS) 677.190. During an investigation, the Board’s Investigations Department will gather information including medical records and statements from witnesses. They may also interview the person under investigation as well as other healthcare professionals. How Long Do Investigations Take? Some medical malpractice investigations may close within a few months while others can take more than a year. Complex cases that include various patients or witnesses and require interviews or additional medical opinions will take much longer. When possible, the Oregon Medical Board will try to complete investigations quickly when the facts are readily available. When the Oregon Medical Board conducts an investigation, it is required by state law to remain confidential. Any information that is collected during a medical malpractice investigation is not considered public record. Additionally, information gathered by the Board in an investigation cannot be used in a malpractice lawsuit. In order to protect complainants, all names are kept confidential during an investigation. In some instances, the physician under investigation may assume they know who filed the complaint due to the specific circumstances, but the Board will not release their identity. Has the License Revocation Process Stalled in Oregon? 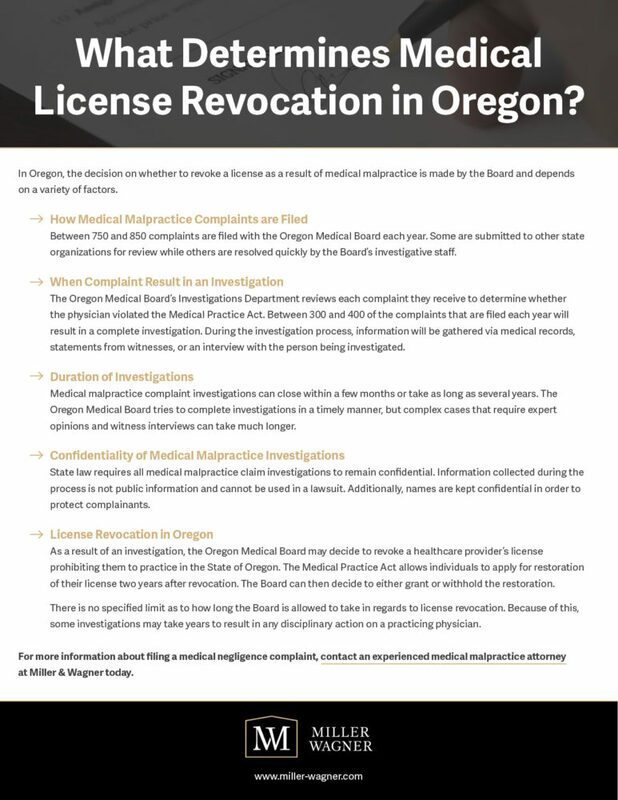 When license revocation occurs, it means that the Oregon Medical Board has decided to take disciplinary action by revoking the licensee’s right to practice in the State of Oregon. Through the Medical Practice Act, a person can apply for restoration of their license two years after it was revoked. Restoration is either granted or withheld at the discretion of the Board. Additionally, there is no specified limit as to how much time the Board is allowed to take in regards to license revocation. Without a time cap, some investigations may take years to complete, which stalls the process of disciplinary action and license revocation of practicing physicians. If you or a family member are a victim of medical malpractice and are thinking of filing a claim, an attorney at Miller & Wager can help you with your case. Contact us today to find out more about medical malpractice and the license revocation process in the State of Oregon.